With the recent death of Regine Crespin, Poulenc has been much in the air. On BBC Radio 4 recently they had a small item about her, and virtually all the extracts were from works by Poulenc - including a thrilling 'Paradisi Gloria' extract from Stabat mater. But what I love about Poulenc above all is his insoucient moments of light-headed charm; light-headed and yet never quite carefree in songs like 'Les Gars Qui Vont A La Fete' (sorry - I don't know how to do accents on my PC). Even that languid masterpiece from Banalites, 'Hotel', has a wistful flavour, an awareness of time flowing past. So I thought it's about time he had a thread of his own. Any favourites of his, anyone? His concerto for two pianos is essential listening. I've listened to the Chamber Music CD on Decca (Performers: Roge, Gallois, Bourge, Portal) a lot of times. My preference goes toward the Sonata for clarinet and piano, and the one for flute and piano, but didn't really deepen my knowledge of this composer, even though I was planning to purchase the entire chamber music set on Naxos and some recording of L'Histoire de Babar. A pianist friend of mine commented this last work on a radio broadcast some time ago and strongly recommended it. Poulenc's Concerto for Two Pianos was the first piece of non-worded music I ever heard that made me laugh out loud. The first movement is hilarious! Poulenc fans in the past got mad at me for saying that, but I can't help it. The first movement is just magnificent. I might be the only person on Earth who takes it that way. I never read or learned anything about the piece except that someone suggested it to me, knowing that I liked very little 20th century orchestral music, and to this day I honestly have no clue how other people perceive it. But I love laughing, so Poulenc gets high marks. I'm not laughing at it, as if I think it's pathetic; quite the contrary, it sounds like he's having fun with Vivaldi and who knows what else, and I think it's brilliant. Other than by Rachmaninov (the you-know-whats), I have yet to find any other concerto from the entire 20th century that I like. Anyways, just wanted to plug that CD. Actual Poulenc fans might not like it, though, I don't know how they rate the performances of those pieces. 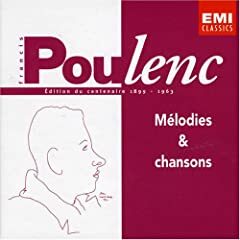 I just found it a nice way to discover Poulenc. Sadly, it's no longer in print, and the used copies I see on amazon.com are US$33+. No way! But if you find it somewheres at a reasonable price, and you don't know Poulenc, it's worth a try! I'm sure your reaction to Francis's Concerto for Two Pianos is spot on. It's mad cap comedy, peppered with references to Mozart one moment, then what sounds like music hall the next, with the occasional whiff of something magical (like the evocation of Javanese gamelan) or wistful (parts of the second and third movements). Poulenc's Concerto for Two Pianos was the first piece of non-worded music I ever heard that made me laugh out loud. The first movement is hilarious! Poulenc fans in the past got mad at me for saying that, but I can't help it. The first movement is just magnificent. I might be the only person on Earth who takes it that way. I never read or learned anything about the piece except that someone suggested it to me, knowing that I liked very little 20th century orchestral music, and to this day I honestly have no clue how other people perceive it. It is a very amusing piece, and I can well imagine laughter during it! I haven't heard the recording you mention, but I can recommend this one, with the Labèque sisters, whom I have also heard live in this -- totally delightful. Just saw Mark's post with that Lynne Dawson CD (and with Stuart Drake, whom I also like a lot). I have only heard her in the Blomstedt/SFO Carmina Burana, in which she sounds terrific. Poulenc was one of the first composers I wanted to know more of. I got lots of LP's from the library : concerto for two pianos, the clarinet sonata, the sextet, Gloria and Stabat mater ( -Paradisi gloria!!!! ), that strange & haunting violinsonata, funny trifles like the sonata for piano 4 hands, Le bal masqué or Les mamelles de Thirésias. The slow movement of the Symphonietta is a beauty and so is the Pastourelle from l'Eventail de Jeanne! I also like a lot of his delightfully unpretencious solo piano works, like the Suite pour piano and Suite Francais (also scored for what I believe is wind band and harpsichord) Some of his stuff is a little too easy and kitschy even for me, though, and sometimes I can get a little tired of certain clichés of his, things that just sound 'too Poulenc', once you get to know him a little.. But then there's the other side of his famous Janus-face; the church music. Apart from the Gloria, Stabat Mater and Salve Regina, I know he has motets, a mass etc that might be worth checking out.. Yes, the two-piano concerto is fun, and Poulence's hugely underrated as a choral writer. My favourite works are the late sonatas, though: the clarinet and oboe sonatas have a remarkable emotional world (the laughter failing to disguise the sorrow beneath), and the two-piano sonata is magnificent. and the two-piano sonata is magnificent. A friend of mine and I performed this a year or two ago... great fun! Dialogues des Carmélites, which features Crespin in Pierre Dervaux' 1958 EMI recording, is probably (to me, anyway) one of the great 20th century operas. I won't spoil the plot, especially since it makes the famous "Salve Regina" at the end that much more moving, but I will say that the story of a community of nuns in Revolutionary France is pretty darned compelling. Poulenc didn't write an opera with many arias and the like, sticking with a lyrical Sprechgesang; the way, too, he wove the music into the story is downright Wagnerian at times. In any event, it is surely worth a spin. Agreed. It is quite powerful. One of Poulenc's earliest compositions (ca. 1919) is a sonata for two clarinets, one in Bb and the other in A. The music is almost entirely bitonal. The music is of moderate difficulty for the most part, but here and there are some really awkward figures which require intense practice. It's a fun piece. Rats! Luke, I let that set you've pictured slip through my fingers fairly recently. It (along with several other sets from the same series), was in a charity shop, along with a 3-CD set from Virgin Classics. Guess which one I picked? I won't spoil the plot...er, because there is no way we are going to find out each nun gets the chop at the end even by Googling it? It is, without doubt, one of the great post-war operas, up there with Britten, Birtwistle and Zimmermann, for example.